As Jews we’ve been know excel in many areas, sadly, playing professional football ain’t one of them. Yes I know about the dynamic duo that is the Schwartz (Mitch/Kansas City and Geoff/free agent) brothers currently taking the gridiron by storm but other than these two wunderkinds right now we are more a nation of football fans and football watchers. No matter where you fit on the spectrum being Jewish means that there is food involved and this year our go to item is wings. 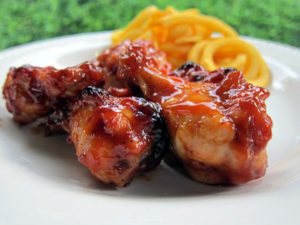 No, not your typical buffalo wings that are either too hot or too wimpy and never just right. I’m talking about finger licking, use what’s in your pantry, your kids will love them too, can’t believe I am reading this and not making them right now delicious. Tip: when you’re preparing the wings for cooking and cutting them into pieces save the tips, freeze them and then use them when you’re making chicken soup. I learned the basics of chicken wings from an article I read in Cooks Illustrated. I give them full credit for the following information. Baking powder draws moisture to the surface of the skin so it can evaporate, thereby making the skin crispier; and baking for 30 minutes on low melts the fat before you ramp up the heat to crisp the skin. Bake the wings on the lowest shelf in the oven at a very low temperature (250 to 275) for 30 minutes which causes the fat under the skin to “melt”, then you move the wings up to the top shelf and crank up the heat (425) which crisps up the skin. These wings look like they’ve been fried and you don’t taste baking powder at all. Preheat oven to 250. Dry the wings thoroughly put them in a plastic resalable bag. Add the baking powder and salt. Close and toss to coat. Place the wings on a baking sheet with edges and place it on the lowest rack in the oven, bake 30 minutes. Push up the heat to 425 and place the wings on the highest rack and cook for an additional 25 to 35 minutes or until they are golden and crispy. Serves 10. Line a cookie sheet with sides with foil and place a cooling rack on it and set it aside. In a LARGE reseal able plastic bag combine the peanut butter, jelly, juice and vinegar. Mix to combine then remove about a 1/2 cup of the marinade for basting. Add the wing pieces, shake to coat. Refrigerate for at least 1 hour. Shake to coat again, turn the bag over and refrigerate for 1 more hour. Preheat oven to 375. Spray the wire rack with cooking spray and place the wings on the wire rack (discard the marinade left in the bag). Cook for 30 minutes, baste with the remaining marinade. Flip the wings and baste the bottom and return the wings to the oven. Bake 25 to 30 more minutes and serve immediately. Serves 8 to 10. Put the chicken wings in a reseal able plastic bag. Add 1/3 cup of soy or miso sauce. Close and shake to coat. Refrigerate for 30 minutes. Heat a deep skillet over a high heat and add the wings and sauce. Cook, searing each side, only 2 to 3 minutes on each side. Add the remaining soy sauce, vinegar. Pour in the other half of the soy sauce, vinegar, and cola. Bring the mixture to a boil then quickly reduce to a simmer. Cook, uncovered (turning the wings occasionally) for 15 to 20 minutes until the liquid thickens. Place the wings on a serving platter, grind the black pepper and green onions over the top and serve. Serves 8 to 10.